Home > Blog > Uncategorized > We have launched a new resin! After lots of research and development we are very pleased with our new resin and the fact that it is so environmentally friendly. CHEMSET® Eco Resin is a lightly fragranced, solvent-free, non-toxic, easy to use, versatile epoxy resin that can be used to produce top quality domed and enamelled items. CHEMSET® Eco Resin is made using epoxy constituents manufactured in a pioneering manufacturing facility that utilises by-products from other chemical manufacturing processes carried out on the same site to produce its top quality epoxy resins. Containing more than 35% less environmentally hazardous epoxy ingredients than other doming and enamelling resins currently on the market, CHEMSET® Eco Resin is a truly innovative product that provides both a reduced carbon footprint and reduced environmental impact compared to other products that can be used for the same purpose. CHEMSET® Eco Resin gives the same high quality finish as our other enamelling resin systems enabling it to be used to enhance the appearance of an ever growing range of products. When CHEMSET® Eco Resin is properly mixed and cured using our recommendations it is completely inert and free from active toxic substances. It contains no solvent or other volatile material and is not flammable at normal temperatures. Being almost colourless, when properly proportioned and cured, CHEMSET® Eco Resin has a water-like clarity and a bright shiny surface that is both hardwearing and scratch resistant. CHEMSET® Eco Resin has good chemical resistance enabling items made with it to withstand dry cleaning solvents when used to make clothing accessories. CHEMSET Eco Resin can be coloured by the addition of up to 5% by weight of any CHEMSET® Epoxy Colour Paste, which must be added to the resin and mixed in before proportioning. These colour pastes contain low concentrations of the same epoxy resin as is used in the manufacture of CHEMSET Eco Resin giving two advantages over other colouring products. Firstly, the colour paste reacts 100% into the cured epoxy and secondly its use maintains the environmentally friendly nature of the resin material. They also contain no solvents or other volatile materials. I am looking for a 2 part resin 1to 1 mix that I can teach with and resell? Hi Dianne, did you get the samples we sent you on the 22nd? Yes, our Eco resin is ideal for jewellery casting. Not only is it tough it is also scratch-resistant. Hi Sharon, thank you for your enquiry. Could you direct us to your selling page please so we can see the type of jewellery you make? We will also need your address and telephone number emailed to enquiries@rfbright.co.uk please. Hi, Would this eco resin be suitable for casting to depths of around 10mm, across c.A4 sized panels? The only other eco resins I’ve found seem to only be suitable for laminating/infusion and not casting, so this would be great if so! What is the cost and how would I go about getting hold of some? Thanks. Hello Laurent, yes, you could use the eco resin for casting to this depth but you would need to build it up in layers to avoid it getting too hot during the curing process. Please email us your contact details or give us a call and we can answer all of your questions. I used polyester and Epoxy resin for years and then switched to BioResin for the past 6 years. It is unreliable as a product and at the moment I am having to order in a very protracted way from a company in France. Could you possible send me a sample and the spec sheets…? I use mostly silicone moulds. I don’t want to go back to working with something as toxic as the polymer resins I used previously but am eager to find a new supplier/material. I need to have a look at how well it could handle my existing jewellery range….does it use a vacuum chamber? (I have one) How is the yellowing? Does the top layer cure or have to be removed? Thank you in advance for your help. Thank you for your interest in the CHEMSET Eco Enamelling Resin. We will email a product information sheet to you and send you a sample to try. Whether or not you need to use a vacuum chamber will depend on the complexity of your moulds and whether you are able to mix without adding in too much air. All epoxies will yellow over time. Provided you follow our recommendations for mixing and curing you will find ours will yellow less than most. Yes, provided you follow our instructions and mix it properly it will all cure! I’m Karon Ng and I am a final year textile design student from Central Saint Martins in London. I am currently working on my final major project that uses sustainable materials. I am very interested in the CHEMSET Eco Enamelling Resin and I would like to know if I could have a sample and a product information sheet of it? We are sorry we have only just received this post from you and have no idea why we got it so late. We hope you passed your graduation with flying colours. Does this product become waterproof when set/hardened? Looking for a non-poisonous resin to use in food environments such as filling small holes in plastic/acrylic sinks. Hello Timothy, yes, the resin is waterproof once fully cured. Our resins are also inert when proportioned, mixed and fully cured according to our recommendations and instructions. You will need to test the bond of the resin with your plastic/acrylic sinks but you should not have a problem if you have roughed the surface first to make a ‘key’ for it to stick to. The surface also needs to be clean and dry otherwise the resin will stick to the dirt/water rather than the surface of the sink! Hi there, I am eager to find a new supplier of eco resin nans love the sound of your product for jewellery making. Is your product tested on animals atall? Could it be classed as cruelty free and vegan friendly? Hello Becky, we do not test any of our products on animals, but some of the ingredients used to make them will have been to comply with health & safety legislation. Please email us for more information. Hi, would this be a suitable medium for embedding sea glass pieces? I’d like to sample it – is it possible to purchase a trial-sized bottle? Hello Rachel, yes, our resins are suitable for embedding items in. 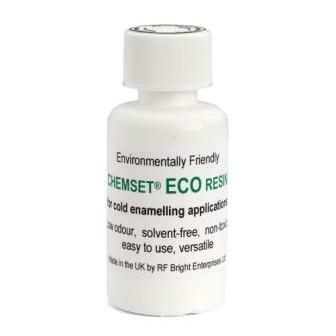 You can purchase trial size bottles of our CHEMSET Eco Resin from the small order agents on our brightenamels website. Click on brightenamels and the link will take you straight to the page. Hi there, is there a limit to how large a volume can I cast with this resin? I understand that I would need to do this in stages due to the heat reaction of casting resin. I work for a product design company that has a particular regard for sustainability. Hello Emily, we would not suggest anything larger than the size of a house brick and you could even get discolouration or an exotherm using this much. It would be better if you could do the casting in layers, which would not need to fully cure between each layer. All of our products are produced in the most sustainable way possible. They are manufactured by ourselves in Kent and we take as much care as we can to produce products that are safe and environmentally friendly. Hi I’m a jeweller and I’m currently experimenting with casting resin in combination with other materials so shrinkage and clarity or especially important. Would it be possible to obtain a sample and data sheet please? So far I’ve been using a polyester resin but if I could get good results with an eco resin I’d be delighted. Epoxies do not shrink very much but it is a problem with polyesters. Our Eco resin has good clarity for casting but the Super Glaze resin has excellent clarity and may be better. However, this will depend on the size of your castings and what you are putting into them. We will send a data sheet to you by email as a pdf. Where can I buy this resin? I’ve checked out the suppliers listed on your other site but none of them list it for sale?! I am a sculptor and have worked with clear cast resin in the recent past, I am hoping to switch to a eco environmental product. Are there colours that can be added to the product and can metal powders also be used as is the other epoxy style resins ? Do you ship to Ireland ? A sample would be great so I can test myself. Hello Kathryn, yes, you can add colours to our resin as well as metal powders. You can view our range of colour pastes by clicking on website. We can ship to Ireland without any problem. I paint. Poured acrylics. I want to use free flow paints mixed with Epoxy resin and silicone to produce paintings in a ‘poured art’ method. Also to give a hard sealed clear surface to canvas paintings eyc. Is this product suitable like ArtResin? Hello Rod, we produce a range of epoxies here in Kent and one of them we call Piccture Glaze. This resin can be used in the same way as Art Resin. It is new this year and has received some very good reviews. Apart from this our Eco resin could be used but it has a much higher viscosity and therefore may produce what we call ‘fish eyes’ if poured over a large surface. This happens because the surface tension of the resin pulls it together. Hi, I’m a knife maker, currently using standard epoxy to fit my handles. I’m trying to stay as environmentally friendly as possible and use reclaimed materials for much of my work. I have kept away from materials such as G10, micarta and stabilised wood as I worry about the cost on the environment. Is your product suitable for lamination and for use in wood stabilisation? Also is it waterproof. I’d live a sample to try. Hello Matt, yes, our products are suitable for laminating and for wood stabilisation; they are waterproof when cured too. You will have to make sure that the wood is totally dry and we would recommend that you seal it with the epoxy first as well. Is it possible for you to send me an info sheet regarding this resin and let me know where I can buy it? Yes, of course, no problem! We will email this directly to you as it is large! Here is a link to our stockists of the Eco Resin . For amounts of 1kg or more you can buy direct from us. Hello Debs, thank you for your enquiry. We will email you a copy of the data sheet. You can get a list of stockists by clicking on Stockists here. I am very excited to see there is an Eco-friendly casting resin available! We will email a product information sheet for the Eco Resin to you to read through. You can buy 1kg, 5kg or 25kg containers of this resin from us directly. If you would like to e-mail your address to us at enquiries@rfbright.co.uk and let us know a little bit more about your requirements we can arrange a sample for you to try. We do send out samples for evaluation. Could you please email us at enquiries@rfbright.co.uk and let us know more about your workshops we will be more than happy to oblige. Please could you send us a sample of your resin for one of our students to try. Could you please let us know for whose attention we should mark the sample and we will arrange this for you. We have some potential uses for eco resin and would love to find out its suitability. Could you tell us a bit more about what you want to do? Will you be adding anything into the resin? If you let us know we can advise further. It is very difficult making delicate things wearing 3 pairs of gloves!!! I sthere any difference in your resin which would make it less likely to cause allergic reaction? We’re sorry to hear that you have developed an allergy to the epoxy materials. You say it is the resin that you are allergic to, do you know this or do you mean the system? All epoxy resins are made with Bisphenol A; if you develop an allergy to this you will not be able to use any epoxy product. However, if it is the hardener component that you react to then we may be able to find you an alternative. We have known several people who have developed an allergy to Bisphenol A and, unfortunately, it is not something that can be overcome. Let us have your response to the above and we will advise further. Hi, l am an artist usually working in a range of mediums. I recently started to experiment with pouring resin mixed with acrylic paint and inks to create images. Unfortunately, l had a very bad reaction to the epoxy resin l was using, in spite of it claiming to be non to ice and safe. I would very much like to continue exploring this style of art but obviously am very concerned about environmental issues and my own health reactions. Would it be possible to use your resin in this manner and if so, l wonder whether it might be possible for you to send me a a sample please? Many thanks. We’re sorry to hear of your allergic reaction to the epoxy resin you have been using; this is not an uncommon reaction. Unfortunately, if you are allergic to epoxy resin it will not matter which epoxy resin you use nor which brand. We are happy to send you a sample of our resin to try in case it is not the resin, but another ingredient in the system you have been using, that is causing the problem. Hello I am excited to have found here….I am a jewellery maker and have been looking for environment friendly resin for new works. Is your resin biodegradable?? Could I have some sample to try? I am happy to send you my online shop link so that you cold see what sort of resin I am looking for. I am sorry but no epoxy resins (or any other polymers) are biodegradable. We are happy to send you a sample if you send us a link to your online shop. So, I have received and used sample pack. And I am happy to say that this is a great resin. Well, this was also my first resin so honestly can not compare with other resins. But it is very easy and pleasant to use, and the result is very satisfying! I make jewellery and the resin was for casting small object inside in a different shapes. All worked well. Thanks! Hi, Where can I buy your resin, I am based in the UK. I can only find it available in the smallest 50g bottle size, which will be fine to try out, but if I like it and want to continue using for my jewellery business I’d need to buy the larger pack size. Beading Fantastic and Cookson Gold sell the resin in 250g and 500g cans (and the hardener in 125g bottles and 250g cans). You will find their contact details at http://www.brightenamels.co.uk/where-to-buy.php#section2. If you want even bigger container sizes you can buy them direct from us. Hi again! So sorry I didn’t explain properly, I am looking to try your eco resin – I already use your regular resin which is great, but I’m trying to make my business ‘greener’ in any way I can, so this would be fantastic as resin is obviously usually not very environmentally friendly. I’ve bought the regular stuff from Cooksons before, but don’t see the eco resin in their shop. Hello Sally, until very recently we were only supplying the Eco resin in 50g bottles but, due to its popularity, we have now made it available through our distributors in 250g and 500g cans. If you ask Cookson Gold for either of these pack sizes they will be able to get it in for you. You will find details of our distributors at http://www.brightenamels.co.uk/where-to-buy.php#section2. Hi, I am an art and furniture design student currently working on an eco-chair. I am hoping to mix an eco-resin with shredded paper coffee cups as a seat for my chair. Would this resin be suitable for my project, or should I be looking for something that can be cast in larger volumes? Thank you for your message about our Eco resin. Yes it will be fine for you to use for a chair seat and will be strong enough without any problem. We’re not quite sure what you mean about its suitability for use with paper though. You will be able to add paper and it will mix in with the resin fine, if it is ordinary paper it may go see through if it is coated paper it will not and will stay looking the same. I make jewellery and keyrings using polyester resin at the moment, but I’m looking to change to an Eco-resin. Could I possibly have a sample of your product to try please? If you would like to e-mail us at enquiries@rfbright.co.uk with your name and address together with a phone number and a link to your products selling page we will arrange a sample for you to try. Hi, I am looking for a more environmentally responsible resin to coat my handmade wooden rings. I am wondering what the durability and strength of the resin would be like in thin layers, applied with a brush to a ring sized object? Our resins are extremely durable and are very strong. They are also hard-wearing and scratch resistant due to their inbuilt resilience and toughness. Thank you. Would you have a data sheet on this product? Hi I’m look for a resin to start a business in wood and resin and making furniture is this strong enough to do and what’s the thickness max you can go also does it come with colours that u can mix in. Is it expensive and can u get large quantities. Our resin is perfect for use with wood and for making furniture! We have a range of colours available and can supply in container sizes from 1 litre up to 25 litres. Are you able to call us during business hours so we can find out more about what you are hoping to achieve? Our number is 01622 717141. If not we can email you a brochure or you can see all of our decorative coatings at http://www.brightenamels.co.uk. I’d like to embed a series of artwork on paper in resin but I am a bit worried about the toxicity of the material. I have found your eco product through google and wonder whether it is possible to buy a small sample to try before I decide whether to use it for my project? Hi, You can buy a 75g sample pack from our small order agents. A list of them is on our web site, I have provided a link for you http://www.brightenamels.co.uk/where-to-buy.php#section2 for easier reference. Our resin is not classed as toxic and can be used safety in the home. Hi Katie, Thank you for your post about our Eco resin. Yes we are happy to send out samples. Could you send us, by e-mail if you wish, a link to your online selling platform. We will also need your address and a phone number please. We can send you information on our resins, including how to colour the Eco resin with all of our colour range, along with the sample. Yes you can use the resin with fibreglass and it will be watertight. It is a fairly thick resin so you may need to trial it first. I’m interested in using your resins to create some jewellery and have some questions. Which is the best to use for jewellery? How is the resin Eco…is it biodegradable? The Eco resin is suitable for creating jewellery and will give you a beautiful bright clear finish. No, epoxy resins are not biodegradable at all so your jewellery will last a lifetime.